In addition to providing an academic curricula, effective middle schools focus on social/emotional development, life skills and engagement. And effective high schools provide support to enhance cognitive skills, engagement and the promotion of leadership. A special focus of high schools is also to prepare students for their transition to post secondary education, vocational/education training, and initial entrance into the world of work. Prevention strategies begin in middle schools and continue into high school. Prevention must be continuous, beginning in middle school and continuing into high school. Strategies that are implemented to promote positive supports and services during the middle school years are likely to positively impact students in their high school years. If there haven’t been effective prevention programs in middle school, then there have to be prevention programs or earlier cessation programs in high school. While high school has been a slightly less researched arena for prevention, there are effective programs available. Schools play an important role in identifying students who are at risk. Students ages 12–18 are likely to have physical complaints when under stress, and they may be less interested in schoolwork or other responsibilities that they previously handled. Although some students may compete vigorously for attention from teachers, they also may withdraw; resist authority; become disruptive or aggressive at home or in the classroom, which may manifest as bullying-type behavior; or begin to experiment with high-risk behaviors, such as alcohol or drug use. Transition from middle school to high school is a critical phase for all students. A fundamental function of the initial middle level education movement was to facilitate young adolescents’ transition into high school (Gruhn & Douglass, 1947; McEwin, 1998; Vars, 1998). Furthermore, in recent years more and more middle schools are developing transition programs to address the particular needs of their students. Safe and Supportive Schools Technical Assistance Center (Center) hosted a Webinar titled “Substance Abuse Prevention in Schools.” During the session, the presenter, Dr. William B. Hansen, President of Tanglewood Research, October 12 and 13, 2011. Cognato, C. A. (1999, October). The effects of transition activities on adolescent self-perception and academic achievement during the progression from eighth to ninth grade. Paper presented at the annual meeting of the National Middle School Association, Orlando. Gruhn, W. T., & Douglass, H. R. (1947). The modern junior high school. New York: The Ronald Press Company. McEwin, C. K. (1998). Concepts of continuing importance. In R. David (Ed. ), Moving forward from the past: Early writings and current reflections of middle school founders (pp. 35-39). Columbus, OH: National Middle School Association & Pittsburgh, PA: Pennsylvania Middle School Association. Vars, G. F. (1998). You’ve come a long way, baby! In R. David (Ed. ), Moving forward from the past:Early writings and current reflections of middle school founders (pp. 222-233). Columbus, OH: National Middle School Association & Pittsburgh, PA: Pennsylvania Middle School Association. Hough, David, (2003). A Bona fide middle school: Programs, policy, practice and grade span configuration – What current research says to the middle level practitioner. National Middle School Association, Ohio. Thompson, K., & Prisbell, L. (1999, October). An alternative to retention: A middle school/high school transition program. Paper presented at the annual meeting of the National Middle School Association, Orlando. Offers school and district administrators and staff a framework and roadmap for adopting a trauma-sensitive approach school- or districtwide. The Training Package includes a variety of resources for educating school staff about trauma and trauma-sensitive practices and for providing school leaders with a step-by-step process for implementing a universal, trauma-informed approach using package materials. Reviews adolescent brain development and how it affects learning, health, and behavior. It features Dr. Frances Jensen of the University of Pennsylvania’s Perelman School of Medicine. Drawing on clinical experience and research, and inspired by her personal experience parenting two teenage boys, Dr. Jensen shares what is known about adolescent brain development, functioning and capacity. Provides an analysis of data from districts on the number of students suspended just once during the school year and the number suspended more than once via the U.S. Department of Education’s Office for Civil Rights (OCR) data collection. 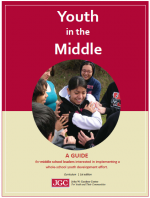 Presents a guide for middle school leaders that describes four work areas central to developing a whole-school youth development approach based on one school's process. The guide describes preliminary evidence of progress, and includes hyperlinks to tools that can be adapted to support similar efforts in other settings. Stress in America: Are Teens Adopting Adults' Stress Habits? What Works for Bullying Programs: Lessons from Experimental Evaluations of Programs and Interventions.